Technically, today is a free day in Switzerland, however Jennifer has organized a wonderful activity for anyone who wants to go: a gondola ride up to the Shilthorn peak, a walk along a ridgeline pathway from Mürren to Grutshalp, and a gondola ride down to the town of Lauterbrunnen. Then everyone is on their own to take the poste bus back to Stechelberg and our hotel (the bus terminus). The mountains surrounding the Lauterbrunnen Valley are so steep, the mountain peaks are not visible from the valley floor. Since so many of us are signed up for this activity today, Sylvain drives us the short distance to the gondola station near Stechelberg, and Jennifer gets a group rate of 57 CF (CD$70) for the gondola rides. The first of four gondolas takes us from the valley floor, over the ridgeline to Gimmelwald, a small mountain community. The second gondola takes us to Mürren, a bigger mountain community. The third gondola takes us a long way up the mountain to Birg, which has a few houses, but is essentially a transfer station to the last gondola, which takes us almost straight up to the Shilthorn peak. The Shilthorn is famous for being the location where some scenes of James Bond movies were shot, where James skis down a steep snowy slope being chased by the bad guys, and takes a luge down the mountain. The weather is totally clear when we arrive, and we have a good hour before some clouds come in and partially obscure the view. At this point, I go inside and have a hot chocolate in the revolving restaurant and post some selfie photos to my facebook page. There is free Wi-fi and good cellular coverage on the peak as well as at each gondola station thanks to Swiss efficiency! We regroup in Mürren, and then hike along a ridge line pathway to Grutshalp. The grade on the pathway is easy, but it is a two hour hike to the gondola station. 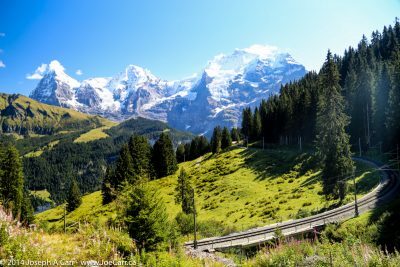 The views along the way are spectacular: there seem to be new views of the Eiger, Mönch and Jungfrau peaks at every turn in the path. 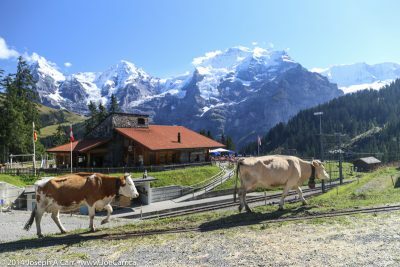 The famous contented Swiss cows with the bells around their necks are roaming the steep alpine meadows, and we stop for yogurt and other dairy snacks along the way. 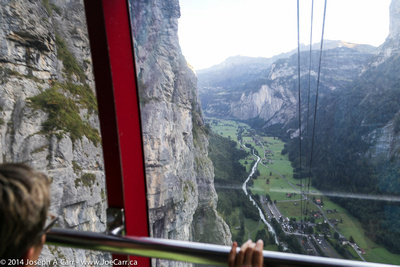 The gondola ride down to the town of Lauterbrunnen isn’t crowded. Some of the group stay in town to have lunch or shop, but I am tired, so I take the poste bus back to the hotel. Even the bus offers free Wi-fi while aboard! Today is without a doubt one of the highlights of the tour for me! Once we go past Genoa and Milan, we cross the border into Switzerland at Lugano, and encounter winding roads, lots of tunnels, and mountain passes. We take the Gotthard Tunnel, the third longest tunnel in the world, and cross over the Sustenpass, where we have a quick rest stop. After descending a steep, winding road, we are finally in the valley at Interlaken where we stop for a bit less than an hour, mainly so everyone can withdraw some Swiss Francs (CF) from the ATMs and banks. One Canadian Dollar equals 0.85 CF, or about CD$1.20 to buy a Swiss Franc. 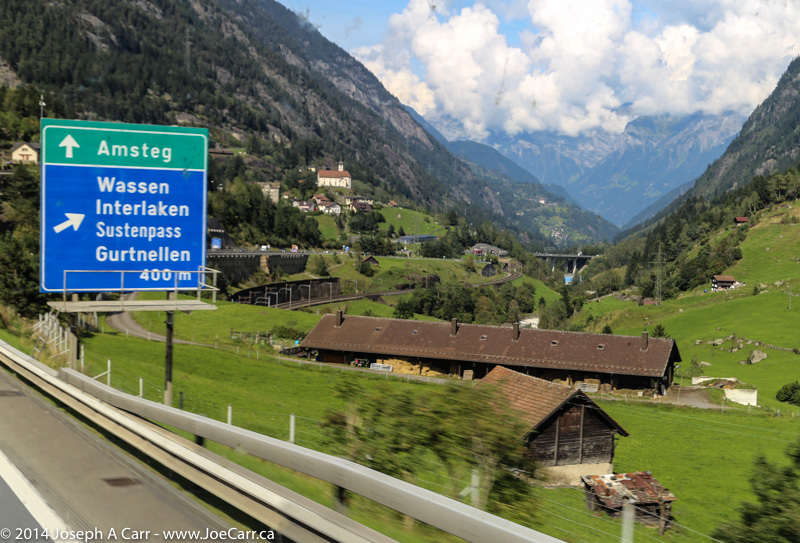 We drive along the Lauterbrunnen Valley to the town of Stechelberg, and then further to the end of the road to our hotel, Hotel Stechelberg. I draw a single room with a sink in it. The toilet and shower are in the hall (one for men and one for women) and shared by 6 others. So this is the most basic accommodation on the tour. I would judge it to be equivalent to a hostel. There is a group dinner provided at the hotel for both nights, since the nearest restaurant is some distance away. Otto, the owner (and chef) of the hotel starts us off this evening with a demonstration of how to make authentic Swiss cheese fondue, and then we follow that up with dinner. Technically, today is a free day in Switzerland, however Jennifer has organized a wonderful activity which most of us go on: a gondola ride up to the Shilthorn peak, a walk along a ridge line pathway from Mürren to Grutshalp, and a gondola ride down to the town of Lauterbrunnen. After we return from our adventures in the Alps, we have dinner at the hotel. I have Weisswurst sausage and the Swiss version of fried potatoes, but don’t have any wine or beer since it is so expensive. I guess we were spoiled in Italy by the low prices for food and beverages. Even a coffee or cappuccino in the hotel is 5 CF (CD$6)! We depart early this morning after having breakfast at the hotel. The light is gorgeous as we drive out of the valley and onto the Autobahn. Our first rest stop is still in Switzerland in the Bern area. I buy nothing at the rest stop since the prices are very high. I have spent all my CF coins, and I don’t want to break another bill, since I can sell those back to my Canadian bank when I return home. As we pass through the French border, there are no formalities. We stop at a mall for lunch, and find the prices much more reasonable since we are now in France.